Mar. 9, 2017 12:00 p.m.
Krisandra Rufus was awarded the Woman of Inspiration Award from Jodi Boyd, executive director of the Campbell River Women's Resource Centre, on Wednesday. Krisandra Rufus was awarded the Woman of Inspiration Award at the Kwakiutl District Council’s fourth annual International Women’s Day Tea on Wednesday. 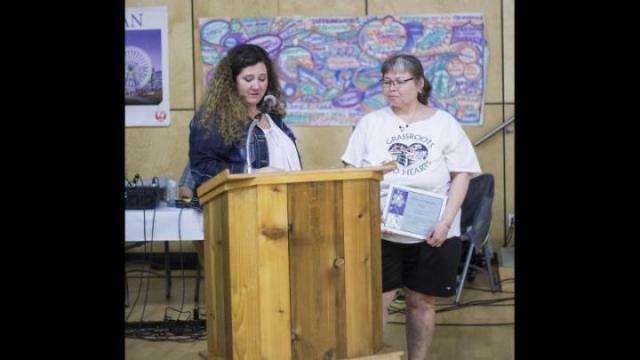 The award was presented by Jodi Boyd, executive director of the Campbell River Women’s Resource Centre, at a ceremony attended by NDP leader John Horgan. “Please know that we genuinely appreciate and value your commitment to the people of Campbell River and remember your commitment helps create opportunities that empower not only our women but our people to succeed and for this we cannot thank you enough,” Boyd said. Rufus is the founder of the Grassroots Kind Hearts Society. Together with a group of volunteers she serves supper to around 30 people in need seven days a week. The tea started off with Campbell River Women’s Centre board member Adrienne Cousins who led the opening dance. As well as the award presentation, the approximately 160 people who attended the tea heard from guest speakers Thanh Tazumi and Cathi Camillerri and participated in the One Billion Rising dance.